Hooray - it's the return of luckless baddie Paste-Pot Pete! Recently released after having helped the Avengers, Pete has decided that he needs a major redesign, as he's tired of being perceived as a "clown". (One can assume this change was Stan responding to reader criticism.) To that end, he takes over an abandoned glue factory, invents a far more powerful form of paste, and - for the first time - designs an actual supervillain costume too! His paste gun is made lighter & sleeker, he does away with the ridiculous paste-pot entirely, and instead store his reserves of paste inside the armored torso he now wears. Stan's certainly doing what he can to try to make the character more than the joke he's always been ... but come on. At the end of the day, he's still a guy who shoots glue! that to the presence of new inker Paul Reinman? 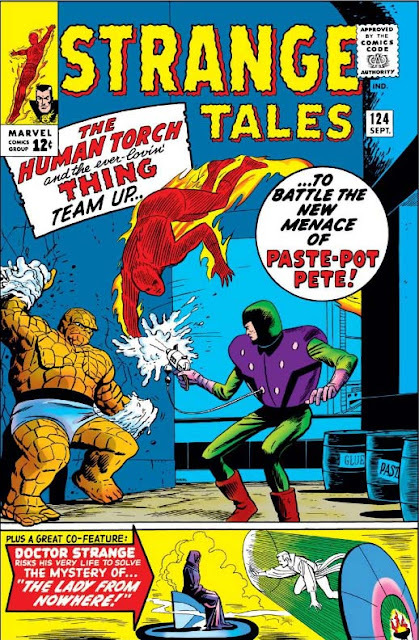 Far from the early days when this was just a Human Torch solo strip, this outing is a Torch / Thing team-up in which the rocky hero gets even more of the spotlight than the flaming teen! (In fact, an end note announces that the feature has caved to popular request, and it's all "Thing / Torch" tales from here on out.) So that may be why this issue's two ludicrous examples of Goofy Silver Age Writing both feature Ben Grimm. The first occurs when Pete commandeers the Thing's Fantasticar and flips it upside down, spilling Benjy out towards the earth below! Somehow this disaster is narrowly averted, though, by Ben flapping his limbs enough during the fall that he's able to change the direction of his descent and land instead in the lake at the middle of Central Park - rather than plummeting straight down, like the massive stone weight that he is. Later, ol' Paste-Pot has Ben pinned to a wall, fixed at the wrists with his new super-glue, and despite all the Thing's straining and pulling, he just can't break his arms free. 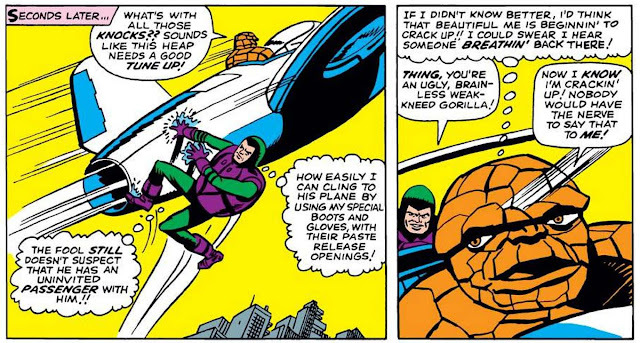 At least not until the Torch suggests Ben stop trying to wrench free from the glue, and instead aim towards breaking free from the wall itself (which the Thing does quite easily). In such a situation, I somehow suspect there wouldn't be much difference! That's a pretty smart addition! Anyone know if we ever see it again? Meanwhile, in the backup story "The Lady from Nowhere! ", Doctor Strange comes across a robed woman wandering the streets, confused and helpless under the power of some enchantment. Tracking down the source of this malady, his mentor The Ancient One sends Strange back in time, where the Sorcerer Supreme confronts an evil magician named Zota. It's really quite refreshing to see Lee & Ditko introduce another villainous spellcaster besides the increasingly overused Baron Mordo - so the fact that the wizard is defeated with incredible ease is a bit of a letdown. Surprisingly, the character would return nearly three decades later, as part of a different time-travel adventure due to events in Marvel's 1991 "Infinity Gauntlet" crossover. Then again, that story was written by Roy & Dann Thomas, and Roy has always had a knack for taking superhero lore from decades gone and crafting impressive, new tales from their forgotten past. In an interesting storytelling twist, Strange ends up defeating the villain only two-thirds of the way through his tale. The final obstacle then comes about as he attempts to race back to the present day, as the route back would only be revealed to him for the length of a candle's burning - and while the Doctor is between dimensions, the flame goes out! Back home, the Ancient One mourns for his pupil, distraught at the knowledge that he now has no one to take his place when he finally must move on; however, Doctor Strange is ever resourceful, and uses the light from his amulet to dimly light his path, lasting just long enough for his return. And in a surprise twist, the "lady" of the title turns out to be Cleopatra! This enchantment, and the subsequent return to her own time at tale's end, likely occurred (from her point of view) before her appearance in Tales of Suspense #44, which begs the question: She really had a knack for attracting those power-mad magicians, didn't she? Doc Strange goes for a spin.